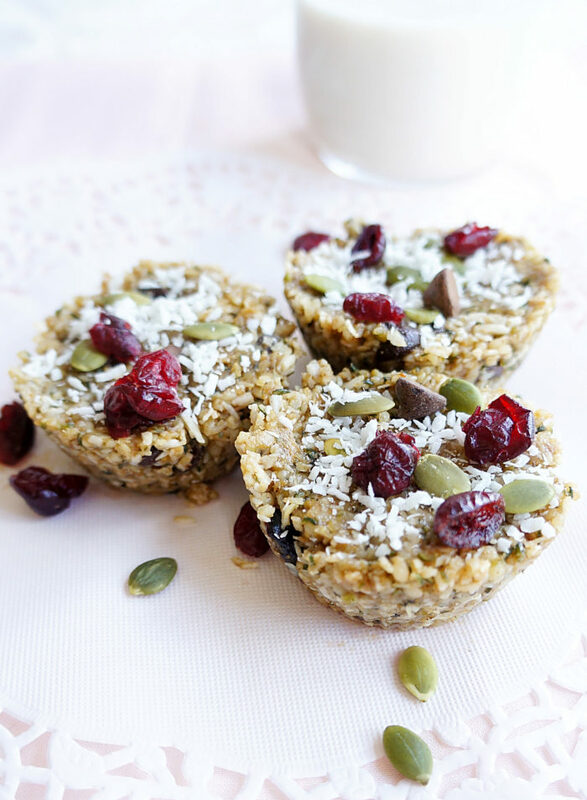 These healthy trail mix energy cups make an awesome nut-free, vegan, and gluten-free snack, while being a great source of protein, fibre and omega 3’s! The perfect option for back to school or as a pre-workout snack! Throughout the months of August and September, I get bombarbed by a whole rush of moms looking for nut-free snacks for back-to-school lunches. And I’m not joking when I say a rush. Last year, I had a giant mob of moms around me for a cooking demonstration that I was doing for healthy nut-free back to school snack ideas. They were practically tripping over each other just to get some recipes. Ohh that dreaded time when you’re scouring the grocery store to find school-friendly snacks the day before school starts, and it seems like EVERYTHING contains nuts. And the ones that don’t contain nuts are usually highly processed, and not something we want to be feeding the kids anyways. In order to prepare myself for the mob, I’ve started experimenting with recipes early. Actually, I was really experimenting for snacks for a sports nutrition theme that I had going on at work, and decided to make it nut-free as well to kill two birds with one stone. The athletic individuals and the anxious nut-free moms. Everyone needs healthy snacks, right? That’s when these trail mix energy cups were born. 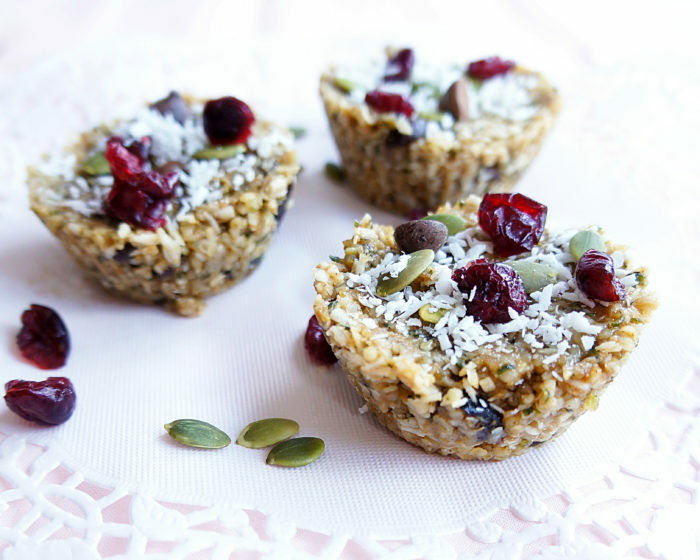 Packed full of Hemp Hearts, they are a great source of protein, fibre and omega 3s. I’ve also incorporated sunflower seed butter to make it a nut-free option, but feel free to sub in a nut butter if you prefer nuts. Then you can basically incorporate some tasty add-ins to make it just like the name. I strongly recommend that you make a batch. because all you have to do is stick them in the freezer and then 30 minutes later, pop them out of the silicone molds. I’m not a big fan of cutting bars. I just don’t have the patience for the crumbly mess, let alone the uneven bars. I’ve never been great at cutting straight. It drives me crazzzzy when the bars are not equal sizes. Yes, a bit of a perfectionist. That’s why I’d rather pack it in and then pop it out. AND not to mention, perfectly portion-controlled. 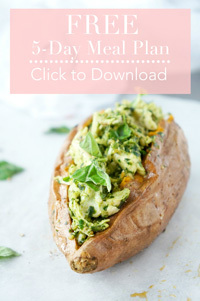 This is a great recipe to have on hand whether you’re an active individual, a mom looking for nut-free snacks to send to school or events, or generally just a hungry person. Mix together all ingredients in a large bowl. Evenly distribute the mixture between 16 silicone cupcake holders in a muffin tin and press the mixture down with a spatula or the back of a spoon until smooth. Place muffin tin in the freezer for at least 1 hour. Once frozen, pop each cup out of the silicone mold. Store the cups in a ziploc bag or container in the fridge or freezer. **If you don't own silicone cups, you can simply press the mixture into a parchment paper-lined baking pan and freeze. Once mixture is firm, remove from pan and cut into 16 squares or bars. Such a lovely combination! These look amazing! Pinned! These look like a tasty and nutritious grab and go snack! Can’t wait to try them! Definitely! I was grabbing these bars all week as a quick and healthy snack on the go! So handy! I love the idea of a cup instead of a bar or ball. They also look really delicious. Thanks I must give these a try. 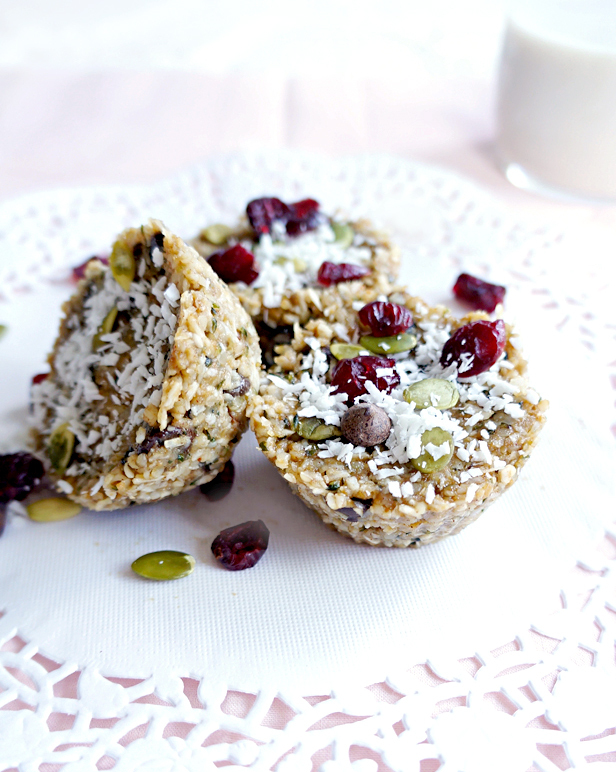 These are the perfect on-the-go energy snack! Love! I love everything about these! I love making healthy treats to take along on our summer adventures…or pack in the lunch boxes during the school year. This is definitely something I would make! These are so cute, and I like that they’re nut free as you said – perfect for back to school! I love everything about these; and what a wonderful idea! I love how you made them into cups rather than squares that needed to be cut out after. I’ll be making these for sure! Thanks so much! The silicone molds are my new go-to for no-bake recipes. So much easier than cutting bars!! I hope you enjoy the recipe! These look delicious and they appear to be low FODMAP, win! I’ll be sharing these on my blog’s FB page, thanks. I love all of the ingredients in these trail mix energy cups. They sound like they would make the perfect afternoon snack for me. I know from personal experience that these cups make a great afternoon snack ;) Thanks for stopping by Dawn! I love this recipe, and more than anything I really like that you have used moulds to make individual cups! Thank you Richa! Yes, those molds make life a whole lot easier…plus, it’s portion-controlled!